“The threat to the planet is us,” says the Canadian novelist and activist Margaret Atwood, “It’s actually not a threat to the planet – it’s a threat to us.” Our whole life is dependent to the environment that determines our proper growth and development. The theme of the Fifth Graduate Students Conference on Language Education, Linguistics and Literature echoes the urgent call for protection of our planet’s diversity of life. Aptly entitled “Living in a Not-So-Green World: Literature, Education and Language in Southeast Asia”, this conference held in Koendjono Room, the 4th Floor of Sanata Dharma University Admin Building on Saturday, 26 November 2016wasa venue to exchange ideas, share knowledge and engage in lively dialogue how the study of English in Southeast Asia, particularly in Indonesia, can contribute to saving our planet. This innovative conference – all organized by the graduate students and for the graduate students– was evidence of, to use the words of the Director of the Graduate Program Prof. Dr. AugustinusSupratiknya, “how far [graduate students] have reached in travelling the path to the English scholarship”. 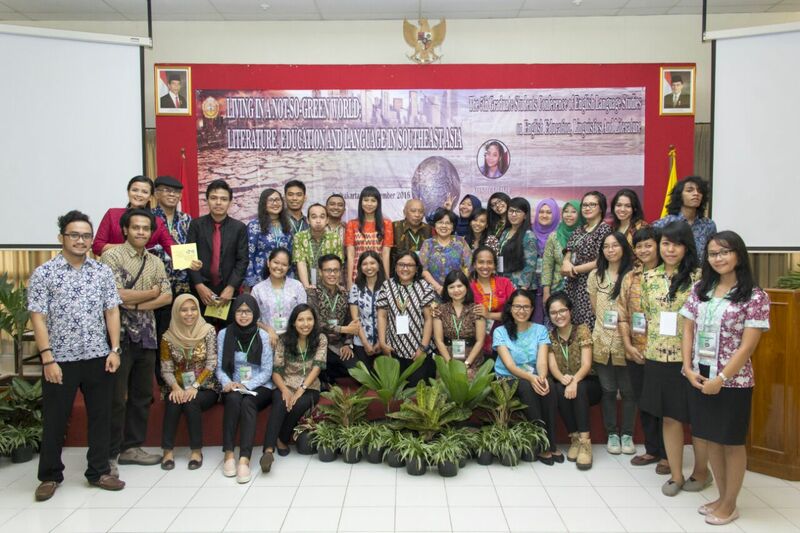 Graduate students of Sanata Dharma University, GadjahMada University, SebelasMaret University, Malang State University and independent scholars/lecturers presented their papers. Dr. L. G. SaraswatiPutri, M. Hum., Head of the Philosophy Department, Faculty of Philosophy, University of Indonesia was the Keynote Speaker of the day. Dr. Saraswati elaborated the concept of symphonic living-togetherness involving The Creator – Human beings – Nature to achieve ecological balance. Everything in this world is interconnected. Local wisdoms, she argued, was important to look after to slow down the process of natural resources depletion. Her knowledge and expertise has helped us think seriously about the threat to our planet and, to repeat Margaret Atwood, the threat to all of us.